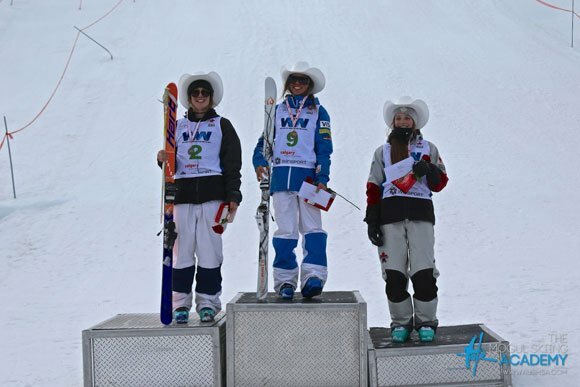 The U.S. Freestyle moguls ski team’s youngest member, Tess Johnson, climbed on top of her first career NorAm podium in duals competition at the first NorAm of the season in Calgary last weekend (The Mogul Skiing Academy). Vail Valley skiers will be in the spotlight once again this weekend as Tess Johnson of Edwards looks to continue her recent NorAm moguls success at Park City and Lindsey Vonn aims to retake the overall World Cup lead in alpine racing in a downhill in La Thuile, Italy. Meanwhile, River Radamus, of Edwards, completed a hat trick on Wednesday at the Winter Youth Olympic Games in Norway, claiming his third gold medal in the final event of the 18-and-under Games, the giant slalom. 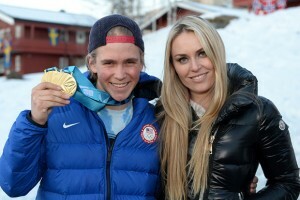 Vonn, official ambassador for the event, was on hand to support her fellow Ski and Snowboard Club Vail athlete. Some local moguls fans, most notably Tess Johnson’s mom Carol, have started a petition drive to include the event in the 2020 Winter Youth Olympic Games. Vail’s Lindsey Vonn, Ambassador for the Lillehammer 2016 Winter Youth Olympic Games, poses for a photograph with River Radamus during her visit to the Games on Monday (YIS/IOC-Thomas Lovelock). U.S. moguls athletes had a strong showing in the first NorAm event of the season, Feb. 13-14 at the Canada Olympic Park in Calgary. Men and women competed in both single and duals competitions, with the U.S. taking 10 of 12 podium spots, including a podium sweep in both men’s events. U.S. Freestyle Ski Team member Sophia Schwarts, of Sun Valley, took the win for the women in moguls, with Johnson finishing third. Johnson stepped things up in Sunday’s duals competition, earning the first NorAm win of her career and landing herself at the top of the current NorAm standings heading into this weekend’s NorAm Cup event with moguls and dual moguls at Park City Mountain in Utah. Emerson Smith (Frisco/Ski & Snowboard Club Vail) took the top spot in duals for the men, with Hunter Bailey (Vail/Ski & Snowboard Club Vail) in third in Calgary. At Lillehammer, Norway, Ski & Snowboard Club Vail’s Radamus becomes the first skier or snowboarder in history to win three individual gold medals – and his mother was there to witness him make history. After grabbing the super-G and alpine combined golds, Radamus was riding a high and carried the momentum into the giant slalom, where he won by 1.07 seconds over Japan’s Yohei Koyama. “Today was a special day. River has been building confidence in his skiing since the day he arrived,” said Chad Wolk, Youth Olympic Games and Men’s FIS NTG coach. “Although the super-G and alpine combined wins were great, River had high expectations for the giant slalom. On Friday in La Thuile, Italy, Vonn lost a ski and did not finish a World Cup downhill won by Switzerland’s Lara Gut. It was the first time the Audi FIS Ski World Cup tour visited the challenging and steep La Thuile track. The snow was grippy and dry, allowing the women to pick up speed and crank sweeping turns. Even with a big mistake, Gut dominated the field, winning by more than a second over Austrian Cornelia Huetter. Vonn was looking for her 77th World Cup win, but it was not her day, as her outside ski rattled off at the top of the course. Vonn’s DNF coupled with Gut’s victory slotted Gut back into the top position for the overall World Cup title by 13 points (1,073 to 1,060) over Vonn. The women tackle another downhill Saturday in La Thuile.